As mentioned in our Tire Performance post, a majority of our customers use their trucks as a daily driver so this means a lot of on road driving. If you’re like me and spend at least an hour in your truck per day for your commute, you want it to be as comfortable and as quiet as possible. The three main options that we are presented with once again are a 1. All Terrain Tire 2. Hybrid Tire 3. Mud Terrain Tire. All Terrains are the best choice for those whose main concern is comfort and driveability. They are designed with the off-road enthusiast AND the daily driver in mind by using a thicker tread pattern and siping that helps off road while maintaining sleek characteristics of a street tire. Out of the three types of tires we typically see on modified trucks, the all terrain has relatively close tread blocks which helps reduce road noise and provide better grip on the street. 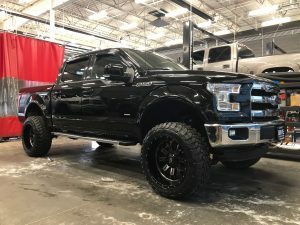 I’ve personally run the Toyo A/T 2 Extremes and was very pleased with how quiet they were and how smooth my truck rode. 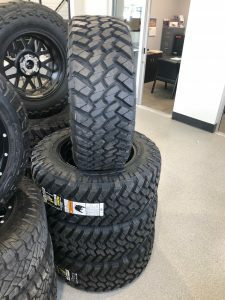 The Nitto version of this tire has also proven itself so if you are looking for a very similar alternative, the Nitto Terra Grappler G2 will perform just as well in my opinion. 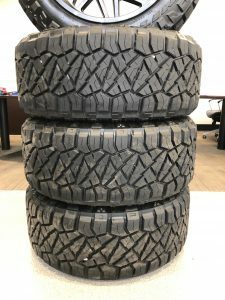 Out of the three types of tires we have discussed, the all terrain will typically have the longest tread life because of their less aggressive design and the type of rubber compound. All terrain tires like the Toyo A/T’s are rated for 60,000 miles. All Terrains can get pricey, but they tend to stay relatively cheap and are well worth it for the longer tread life. I am currently running a hybrid tire on my truck and I am very pleased. I currently have a set of 35” Nitto Ridge Grapplers on 20” wheels on my truck. I am almost compelled to say that their comfort level is the same as an all terrain tire, but in my opinion they are slightly louder and slightly more bumpy on the road; however they are very close when it comes to comfort. As far as driveability I would rate them higher than an all terrain tire. They perform just as well daily driving as the all terrain and I think they perform better in snow and off road conditions. I drove through a couple bad snow storms this year and they handled great as well as the couple times I’ve been in mud and doing minor off-roading. There aren’t many hybrid tires on the market as of right now and the ones that are available have not been out for very long. 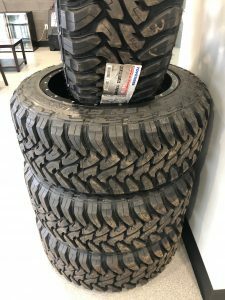 The Ridge Grapplers came out in the spring of 2016 so there hasn’t been quite as much testing to go off of as we’d like but so far it seems like they are very highly rated. I have about 10,000 miles on mine and they seem like they are wearing at the same pace as an all terrain almost. It’s looking like they could get close to the 60,000 mile mark. Out of all of the tires we’ve discussed, a mud tire is going to have the least amount of comfort and worst driveability on the road in my opinion. Mud tire rubber compounds are built primarily for offroad use to withstand sharp edge punctures and hard impacts. With that performance aspect being the primary goal, things like on road quietness and comfort are afterthoughts. Mud tires have come a long way from very aggressive tires like the Super Swamper to a new age mud terrain like the Toyo M/T. If you were running Super Swampers and going 80 mph you wouldn’t be able to hear yourself think because they’re so loud. While tires like the Toyo M/Ts or the Nitto Ridge Grapplers are still loud, they are nowhere near what the earlier, or currently more aggressive mud tires sound and ride like. When I was running Nitto Ridge Grapplers on my truck I did notice quite a bit of road noise and I would have more of a rough ride, but they were great in mud and over large rocks. I’ve gotten mixed answers from our customers, from research, and from owning sets of mud terrains before on how long they last. I’ve gotten between 35,000-40,000 miles out of my personal Trail Grapplers rotating them every 5,000 miles. I have also known people to get as low as 25,000 miles and as high as 55,000 miles out of their mud terrains. 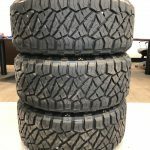 There are several factors that contribute to this: if you are running mud terrain tires on a ¾ ton or 1 ton truck, chances are you are going to be on the lower tread life side because the truck is so heavy and chances are if you have a truck that big you’re either hauling heavy loads or pulling a trailer which contribute to quicker wearing. Conversely, if you are a Jeep owner and use your jeep to commute on a highway and take it out on the weekends you may be able to get closer to that 55,000 mile mark mainly because of the reduced weight. If you are like us and do mostly on road driving then an all terrain or hybrid tire would win the driveability, comfort, and tread life test. If you are looking for that aggressive look with great on road performance then a hybrid tire works great for you. If you don’t care what it looks and more concerned with comfort and tread life then an all terrain might be the best option for you. 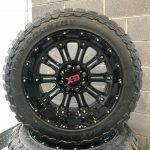 If you are mainly off road or are looking for a tire for your off road vehicle and are concerned with the driveability in that environment then a mud terrain tire is for you. If you don’t care that they’re a little loud and bumpy on the road and want a tire that will do anything you need it to if you decide to go off road then go for a mud tire! After all they look the meanest in our opinion! About 95% of our vehicles have brand new wheels and tires already installed. If you are in the market for a custom vehicle please feel free to call or text us with questions 801-609-2277.
iDrive Utah is proud to be a sponsor for the Pleasant Grove High School Baseball Team for the 2019 Spring Season! As of today, the Varsity team is coming off of a 10-0 win against Farmington High School with a 4 game win streak. They are a force to be reckoned with this season! We look forward to seeing them at the State Championship this year. 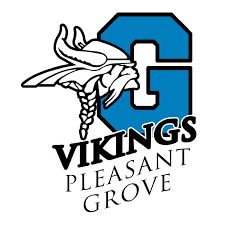 Please click the link below for the Pleasant Grove High School Varsity Baseball Team Schedule. There are several different aspects when it comes to modifying your truck. From suspension modifications to aesthetic modifications like paint matching and tint. Arguably, the most important part of your truck modification is the tires you install. The reason being is that tires are the only thing separating your truck’s performance and suspension mods from the road. 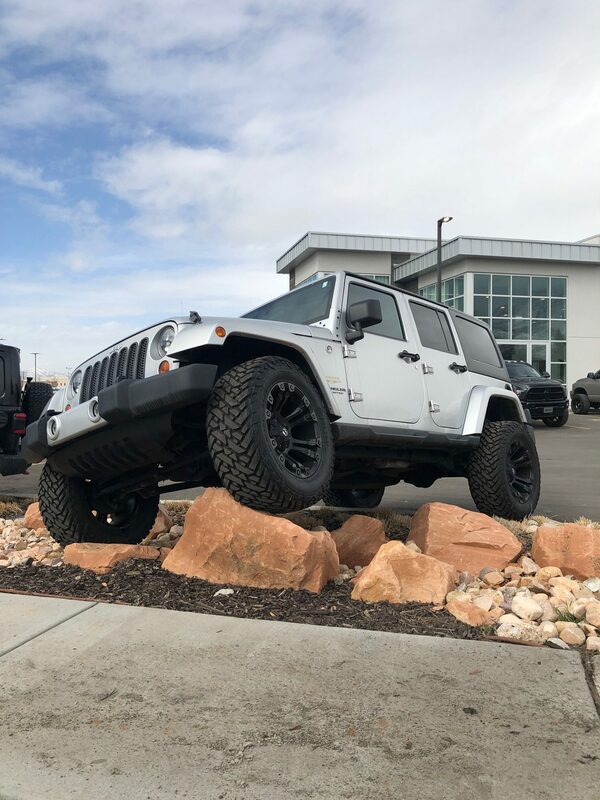 Whether you are wheeling in moab or trying for your fastest quarter mile time the kind of tire you use will determine how well your vehicle performs. In our case the three things that we feel are most important to consider when tire shopping are 1. Performance 2. Comfort/Driveability 3. Tread Life. This post will cover the performance aspect. Please see additional posts for Comfort/Driveability and Tread Life. In Utah we experience all four seasons so it is important to have a tire that performs well in several different conditions all year round. When winter comes around we need something that is going to provide the traction we need in the snow. Most would say that the best tire to run in the winter would be a snow tire. While this may be true, it may not be the most cost effective or best looking option. Snow tires are made of a softer rubber compound which means that if weather is going to consistently be over 45-50 degrees then they will wear a lot quicker than a normal all season tire. In a climate like ours and much of the country where the high temperatures in the summer are consistently over 80 degrees we would have to be switching between tires every year. If you are like us and don’t want to be swapping tires out a couple times per year and like an aggressive looking alternative that has great performance then we recommend a Hybrid tire. Hybrid tires are a cross between a mud terrain tire and an all terrain tire. Some hybrids that we have had great experiences with are the Nitto Ridge Grappler and the Toyo R/T. Our customers love these tires because they have the aggressive look that they want and are great in the snow and off road. A majority of our customers use their trucks to commute on paved roads, but when the snow falls or they want to go on a weekend camping trip, they know that their tires will perform exceptionally in both conditions. Not only are they great in snow and off road conditions, but some are also rated for higher load capacities for heavy duty trucks and when towing heavy loads. Specifically, the Ridge Grappler comes in E and F load rated tires in certain sizes. In essence you get the best of both worlds: a tire that can handle your heavy camp trailer and the off road conditions that you encounter when heading to your favorite camping spot. We have also run several mud tires like the Toyo M/T and the Nitto Trail Grappler. These mud tires are the most aggressive looking tire that we put on our trucks. It’s in the name so these tires are meant to perform best in the mud or any off road conditions you throw at them. With their thick sidewalls and deep tread pattern they can manage most off road situations with ease. While they look the most aggressive, their performance in snowy road conditions is not the best in our experience. Don’t get me wrong, they get the job done, but other options like the hybrids or all terrains which have substantial siping provide more grip in snowy road conditions. All Terrains are also a great alternative like the Toyo A/T2’s or the BFG KO2’s. They don’t look quite as aggressive, but do tend to have plenty of grip in moderate off road conditions and some may argue that they may perform better in snowy road conditions. Another positive to going with an all terrain tire is that they typically have less road noise and ride better than a mud terrain tire or hybrid tire. In our experience, depending on what you use your truck most for will determine what tire will perform the best. If you are like us and drive your truck on the road 80% of the time or more a hybrid tire would be your best bet. Especially if you like the aggressive look of a mud tire. If you are purely concerned with overall 4 season performance and don’t care for an aggressive looking tire, then a good all terrain would be your best bet. They tend to last longer and perform well in on road conditions. They will also get the job done for occasional off roading. If you are an off road enthusiast that’s constantly in the mud or dirt, then a mud terrain tire would perform the best for you. While they don’t have the longest tread life and can be noisey on the road, they are the most aggressive looking tire with the highest level of off road performance. There are several different options to make your truck have the aggressive stance we all want. The first option and most cost effective suspension modification is a level kit. Level kits come in a couple different sizes usually anywhere from 1 inch to 3 inches. Our go-to is usually a 2 to 2.5 inch. It gives you just enough to bring the nose of the truck up enough to change the look of the stance and allows us to squeeze a little bit bigger tires on it. It also minimally changes the suspension’s geometry which means less wear and tear on front end components such as ball and CV joints. While being the most cost effective, the level kit does not deliver the performance or ride quality that a coil over lift kit can deliver. 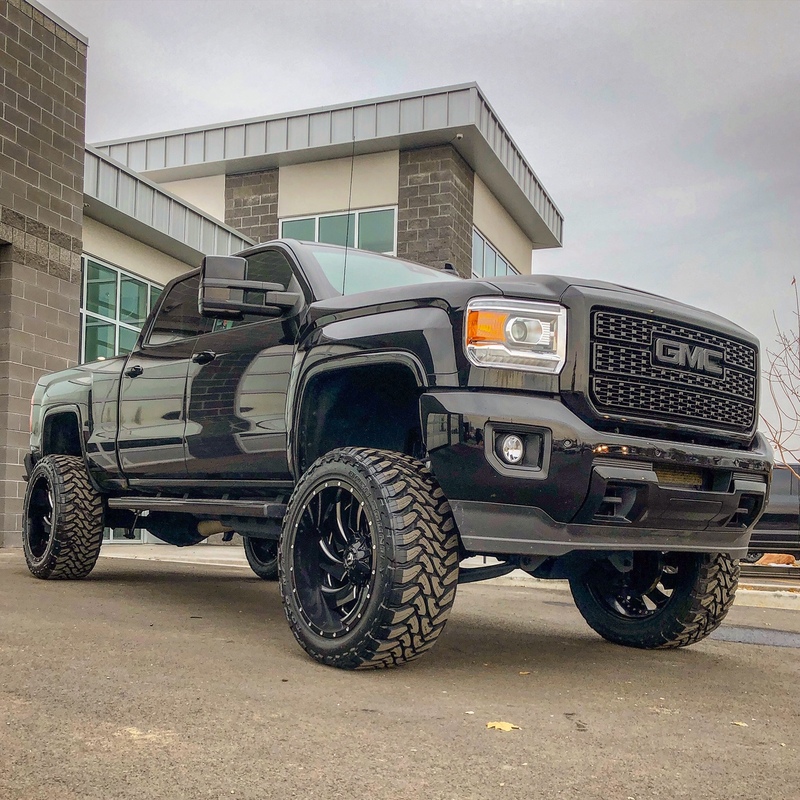 Alternatively, if you are looking for increased performance, but do not want a monster truck lift, you can always go with a small coilover lift. We typically see those up to 3 inches for those who are looking for a “leveled” look and they can be adjustable. Coilover lifts also sometimes come with an upgraded rear shocks to complete the kit. 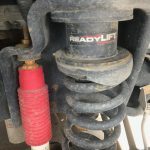 If you are concerned with ride quality and offroad performance then it may be worth it to you to spend the extra money and go with a coilover lift. The other suspension modification is a lift kit. There are several different kinds of lifts that you can go with. Similar to a level kit, the first option and most cost effective is a strut spacer lift kit. We mostly use Rough Country Lift Kits when it comes to this type of lift modification. This type of lift kit is similar to a level kit in that you still use your stock strut assembly in the front and just add a larger block on top to get a more substantial lift. The nice thing about these kits is that they are very cost effective and they still come with the components necessary to maintain correct suspension geometry. Starting in the rear, the BDS lift comes with thicker/stronger u bolts that hold in the brand new blocks that lift the rear as opposed to the Rough Country lift that has thinner u bolts and adds another block to the already existing stock block. In the front, the main component that makes a big difference is that the BDS lift includes a new, longer coil where the Rough Country adds a spacer to the stock coil. The BDS lift will come with an entirely new trackbar drop bracket, while the Rough Country utilizes the stock trackbar brackets. The BDS lift kit will also come with a drop-pitman arm where the Rough Country Utilizes the stock pitman arm. To recap the most cost effective way to raise your truck is a level kit. The parts are inexpensive and labor time is usually not too long. Level kits also do not change suspension geometry very much so you don’t have to worry too much about substantial wear and tear on your stock suspension components. The other mild form of suspension modification would be a coil over lift. This is for the people who want extra performance and ride comfort, but don’t want a big lift on their truck(usually up to 3 inches). For those that want to lift their truck 3.5 inches or higher there are several lift kit options. 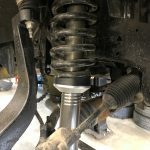 A strut spacer lift like the ones Rough Country offers is a great way to achieve the look that most people want in a lifted truck. The other option of a full suspension lift like the ones from BDS are for those who are looking for the extra performance and ride quality. 5 Aesthetic Truck Customizations That You Need To Do! The first place we start with truck modifications is the suspension. Depending on if our customers are concerned with performance, or strictly just looks will decide what set up we do on the truck. The first option is a level kit. Level kits essentially add anywhere from 1 to 3 inches of height to the front of the vehicle. We typically use a 2 or 2.5 inch level kit. 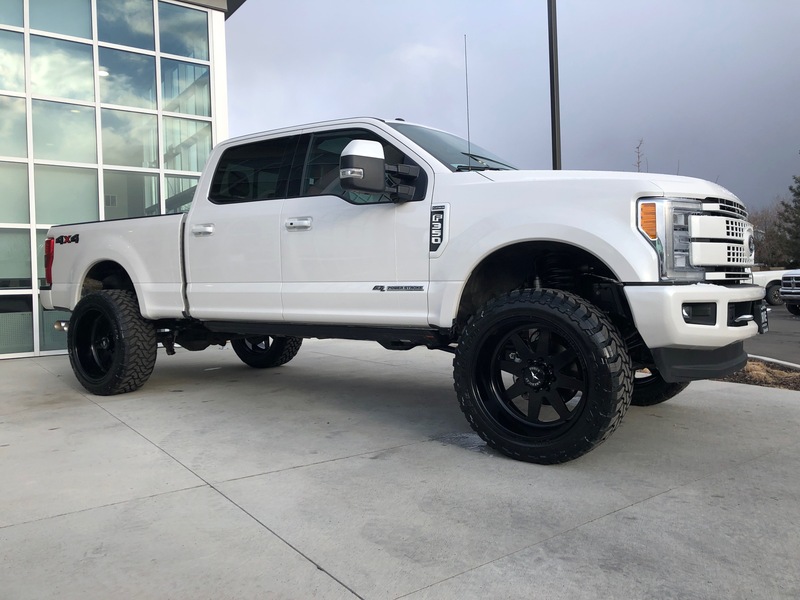 This allows us to fit 33 inch tires on most half ton trucks like F-150’s or 1500’s and sometimes up to 35 inch tires on a F-250 and up or 2500 and up. This gives the truck the custom and aggressive stance we all look for. If performance is a concern, we can do a coil over lift which can be adjustable usually up to 3 inches. You get the same amount of height as a level kit, but with the performance of aftermarket off-road suspension components. The other type of lift that we install which is more geared to performance and ride quality would be something like a BDS lift kit. 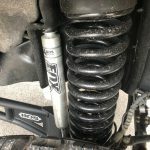 The main addition that the BDS kit adds would be new full length coils/springs in the front and Fox Racing Shocks in all four corners. 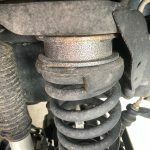 Please see our “What You Need to Know About Truck Suspension Modification” post for more information on suspension modifications. Now that we have our lift kit or level picked out, we can determine what size tires we can fit on our truck. 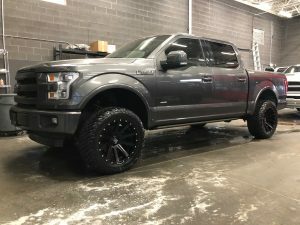 As mentioned before, level kits can fit up to 35 inch tires on some trucks (with trimming). Once you go up to the higher lifts, 6”+ you can fit 37 inch tires and up. The type of tire can also contribute to the aggressiveness of the look of your truck. 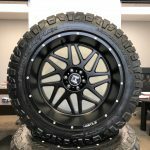 Mud terrain tires like the Toyo Mud Terrain or Nitto Trail Grappler will satisfy anyone looking to have a very aggressive look or high offroad performance. 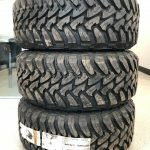 Hybrid tires like the Nitto Ridge Grappler are a great middle ground for those who don’t want the negative aspects of running a mud tire, but want the aggressive look (one of our favorites). All terrain tires like the Nitto Terra Grapplers and Toyo All Terrains are great options for those that are concerned with on road performance, but also like to have an aggressive look and offroad capability. Please see our “5 Things You Need to Know When Choosing Tires for Your Custom Truck” post. Your wheel selection is the cherry on top of picking your suspension and tire modifications. There are thousands upon thousands of options to choose from when it comes to wheels. You could go with a smaller wheel/high offset like a pre-runner or baja truck for the offroad look. Or, you could go with bigger wheels with a negative offset and smaller tire profile for a more “stanced” look. 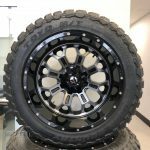 For more details on picking aftermarket wheels, check out our “Best Aftermarket Wheels For Trucks” post. Tint is one of the most cost effective ways to make your truck, or any vehicle for that matter look more better. Not only does window tint make your vehicle look more refined, it also serves a great functional purpose especially if you live in a warmer climate. Tint helps keep UV rays out of your vehicle leaving it noticeably cooler when it is hot out. Debadging and painting emblems is the cheapest way to give the finishing touches on your custom truck look. If you’re going for an all around “clean” look, debadging is the way to go. All you need is a heat gun to heat the glue behind the emblem, some fishing line to peel the emblem off, solvent to get the remaining glue off, and if you want to be a perfectionist you can buff off the remaining glue with a microfiber cutting pad. Painting the emblems or “blacking” them out is just as easy. Most people use plasti dip to do this. All you need to do is tape off the area around the emblem and throw on a few coats. The nice thing about plasti dip is that you can spray it directly on the paint and peel it off. If there are ever any imperfections you can always peel it off and redo it. Both of these methods are a sure way to have your truck looking great. 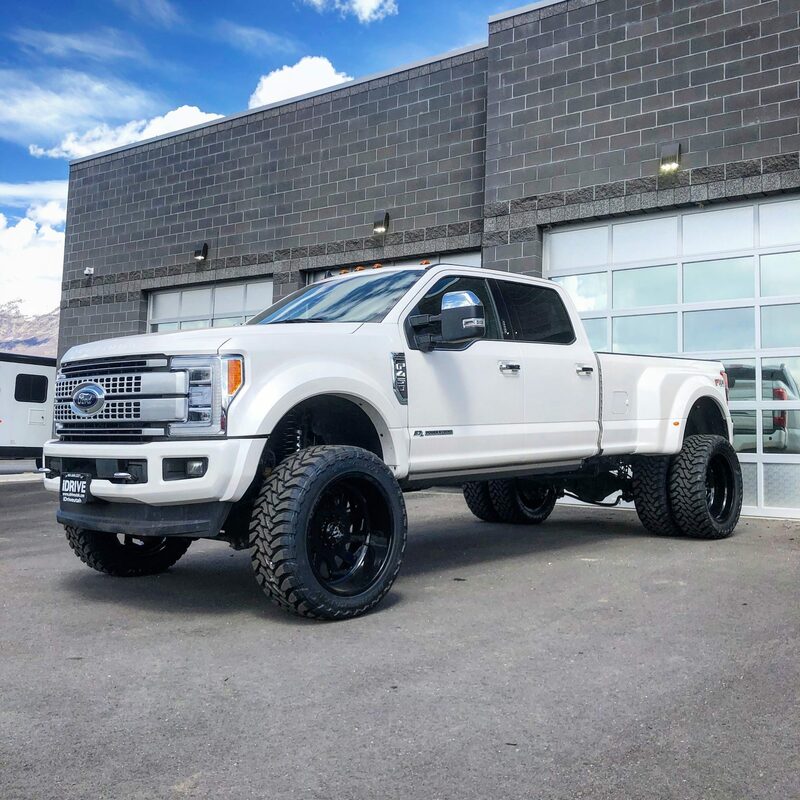 If you are like us and want a truck that has the modifications mentioned above already done when you purchase your vehicle please visit iDriveUtah.com for out latest custom truck inventory, or call/text our knowledgeable sales staff for more details at 801-609-2277. Why Buy a Custom Truck From iDrive? Many of our customers come in and ask questions along the lines of: “Where do you get your trucks?” “Who builds our trucks?” “What types of components and parts do you use?” The intent of this article is to answer these questions and to tell our customers how we do business so that when the time comes to purchase a new custom truck, the decision to do business with iDrive Utah is a no-brainer. Our mission at iDrive is to provide our customers with world class customer service and the best selection of custom trucks on the market in the nation. We’re able to do this by hand picking our truck inventory and performing inspections by our certified mechanics to ensure we sell reliable trucks. Our motto is that we will not put trucks on the road that we would not trust our families driving. Once our trucks pass through the inspection, the fun begins… The modification phase. Almost all truck modifications are done in house by our experienced mechanics. At this point we have already ordered the brand new components for the truck build in regards to wheels, tires, lift kit / level kit. We also do paint matching, custom bumpers, custom headlights, custom tail lights, and much more! At iDrive Utah we use only the highest quality custom truck parts for lift and level kits. The main products we use are BDS Lift Kits, Zone Lift Kits, Fabtech, Rough Country, Terra Flex, Pro Comp, Ready Lifts, and Carli Suspensions. We love using Fox Shocks as well as Falcon and Bilstein Shocks. When it comes to wheels and tires we have an endless selection, but mostly choose from the following brands: American Forces, Hostile, Fuel, Method, and XD Wheels. 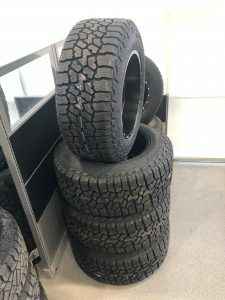 We are very particular about the tires we put on our trucks because we want them to last our customers as long as possible while having the off-road aggressive look. We mainly choose from Toyo, Nitto, and Fuel Tires. iDrive undoubtedly has cleanest selection of custom trucks in the nation and we have something for every budget. Please feel free to reach out to us with questions. Call or Text 801-609-2277, or come see us at 1850 N. State St. Orem, UT 84057!